A simple step-by-step system to declutter your entire home. 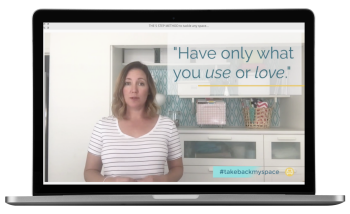 An online program with daily decluttering tasks to take back your space. SAVE 38% DURING THIS FLASH SALE! Are you ready to finally succeed in clearing out the clutter and create a beautiful home you're proud of? Do you struggle to figure out where to start decluttering first? Does it seem like you're just shifting things from one area to another and making a bigger mess? Are you overwhelmed by the amount of stuff you need to go through? Is it hard to decide what to keep and what to let go of? Especially with sentimental stuff? Do you often think if you get rid of something, you'll discover a need for it later? Or maybe you start, but get burned out and never finish. You wish someone would just take you by the hand and guide you through each step in order, on a realistic schedule. Finally, you can declutter your home even if you don’t have entire days to dedicate to the task. "Thank you for a great product! This course is perfect for me! I’m not a disciplined/organized person by nature, but I work really well under someone else's well-designed system! You break [decluttering] down with smart strategies, systems, and built-in accountability, that made me so successful! 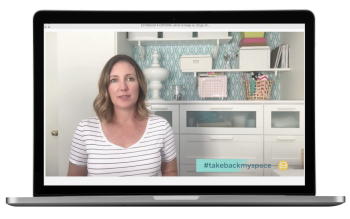 I’ve read declutter books, internet materials, and other online courses, and this one worked best for me!" Everything you need to systematically declutter your home can be accessed from the comfort of your sofa. All you need is an internet connection! How to create a criteria for what to keep and what to let go of. This criteria will allow you to make quick -- and smart, decisions about what to keep and what to let go of. --You'll even learn how to make decisions about sentimental items that will allow you to keep what's most important and let go of the rest without guilt. The 5 step method to tackle any space. Learn how to approach each focus area one part at a time and in short focused amounts of time so you don't get burned out. Put your new skill to use right away during the 5 Day Kickstart! There's no better way to get motivated than to see results right away. 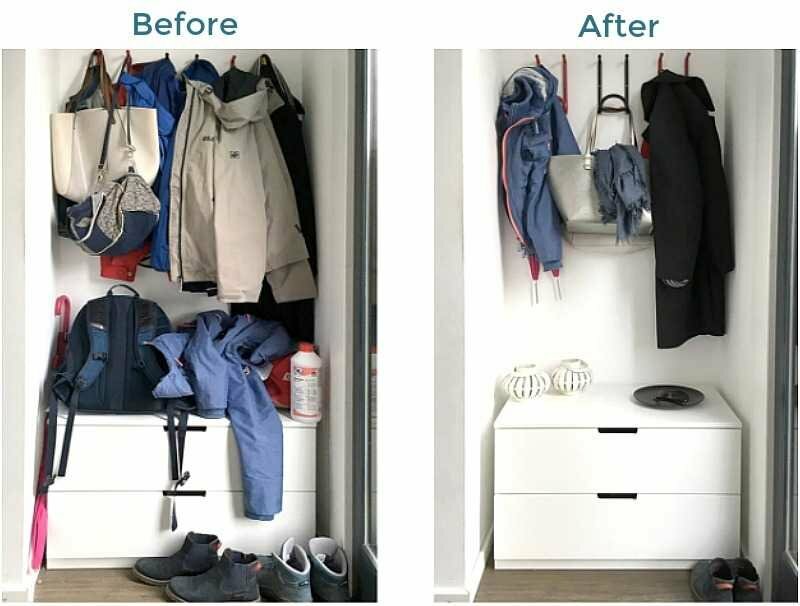 I designed The 5 Day Kickstart to quickly declutter areas that have the biggest impact on the way you feel in your home. --Get ready to love walking in the door after a long day! Tackle big problem areas with the 5 area plan. 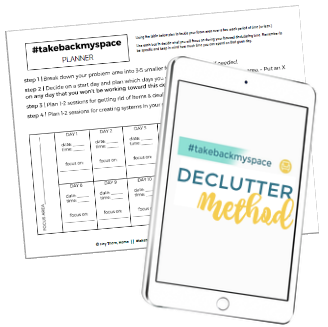 Follow the step-by-step decluttering tasks for each area and use the printable planner to track your progress and set the intention for each decluttering session. Built in time to deal with trash and donations. The system includes built in time to deal with both the items you're keeping and the items you're getting rid of so you complete an area before moving on. Create systems to keep the clutter from coming back. The last thing we want is for all of your hard work to go to waste! I'll show you the exact systems I use to keep things like paper clutter or kid art organized and give you time to set up your own systems. Resource section for your big questions. When to sell vs. donate vs. toss? 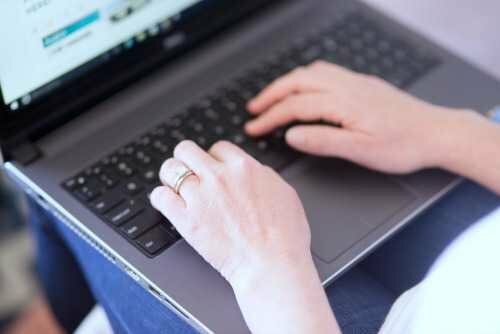 Where to sell your used stuff online. 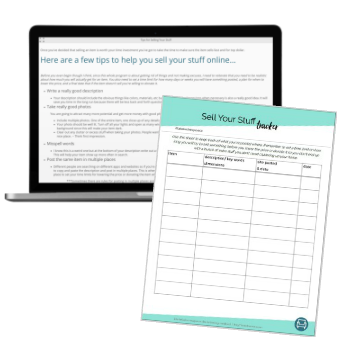 Tips for selling your stuff online for top dollar. Tips for dealing with sentimental items. A method to tackle any area in the future. 2019 calls for new habits! Get lifetime access to the program for one low price during this one time offer! I wasn’t sure that I’d make any real progress in decluttering my home, since this isn’t my first attempt at this, but I’m telling you, I’ve never felt so good in my home! Finally with this course I’m able to stay on track with the simple step-by-step tasks to follow in each area of my home. and I believe that decluttering is the single most important thing you can do for yourself and for your family. --I mean who doesn't want less stress and more joy in their life? I also know that decluttering is one of those yucky tasks you will put off forever because the final result can seem so far out of reach. But what if the task, as big as it may seem, was broken down into small manageable to-dos? 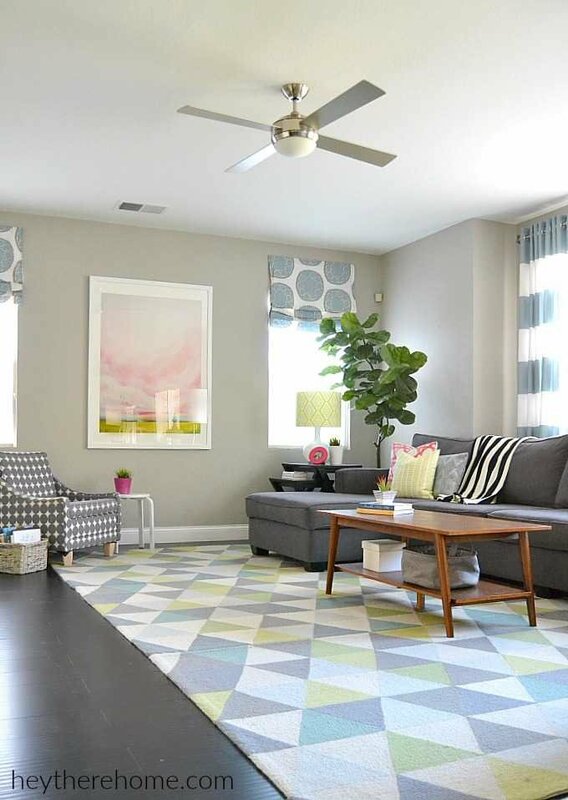 Over the past several years I've been working toward a more simplified and clutter free home. 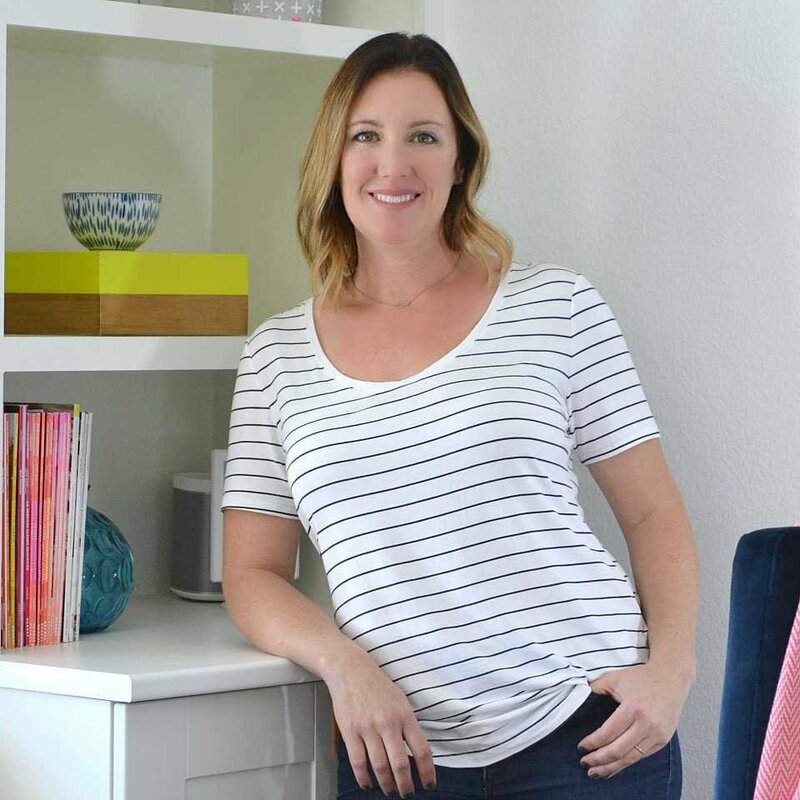 Starting on what seemed like "too much to handle" was so incredibly difficult but over time I was able to teach myself a new way of thinking about what we own and create a method to tackle any space in my home. How would having a decluttered home change the way you live? Would you have less stress and more mental clarity? Would you be able to finally relax after a long day? Would you invite friends and family over more often? Would you save the time and frustration that comes from looking for misplaced things? Would it be easier to keep clean and tidy? Would you finally be free of the past? You can do this even if you don't know where to start and don't have a lot of time! "Life is already so busy, I don't have enough time!" No problem. You'll get a decluttering plan for you that breaks down big decluttering tasks into short manageable sessions of about an hour each. How many tasks you do each week is totally up to you. "I've let my clutter get so out of control and put it off for so long because I don't even know where I'd start." Don't worry about that at all! Seriously, this course walks you through every step to get you ready and prepared to make even the toughest decisions -- and we start with mini decluttering tasks so you can ease into the method and practice your new mindset. These warm-up tasks will give you quick wins and you'll use that feeling of accomplishment as we move into bigger areas in your home. But don't worry, even these big areas are broken down into short decluttering tasks and are in a specific order for you to follow so you never have to guess what to do next. I know, there can be a lot of questions, confusion, and overwhelm when you're decluttering. If you don’t have a plan to follow, it can be easy to make some critical mistakes, get burned out, and never end up with a home you love. Without guidance and support, it can be difficult to make any progress at all! That’s why I’ve created this step by step course! The course starts as soon as you enroll! 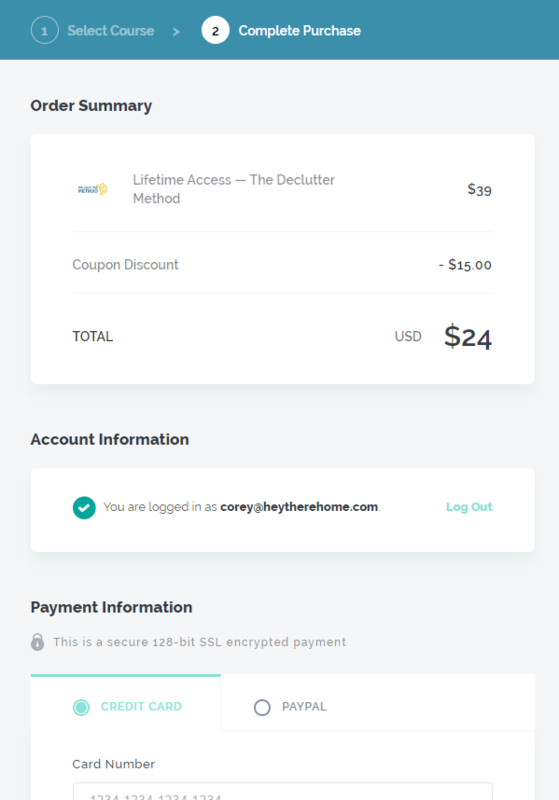 This is your chance to get lifetime access at the lowest price! We wholeheartedly believe in The Declutter Method course, and have many satisfied students. But we want you to feel confident in trying it out for yourself! That's why we have a 100% Risk Free Guarantee. If you do the work, put in your best effort, and feel that we haven’t delivered, we will issue a 100% refund. Complete your purchase using a credit card or PayPal. Step 2: You'll receive an email with all the details. Login info and what to expect. 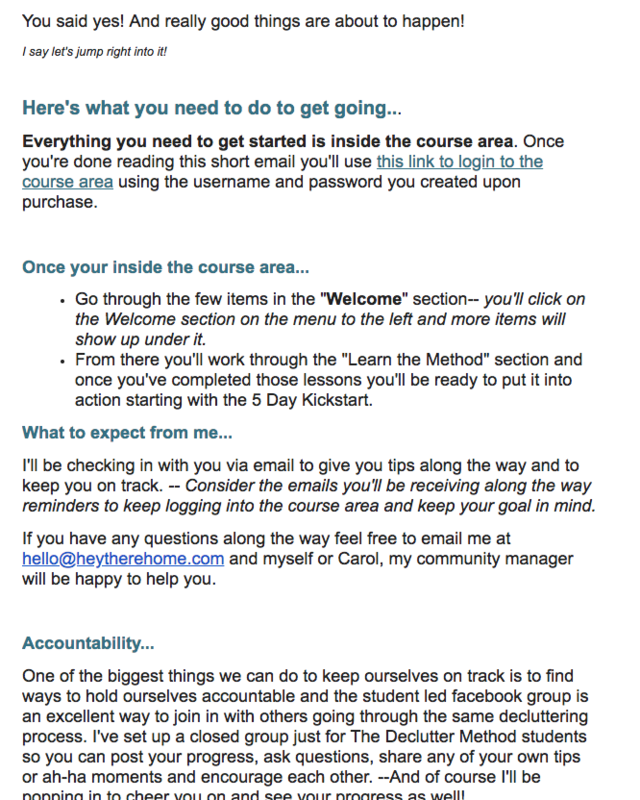 Step 3: Get instant access to all the course material. 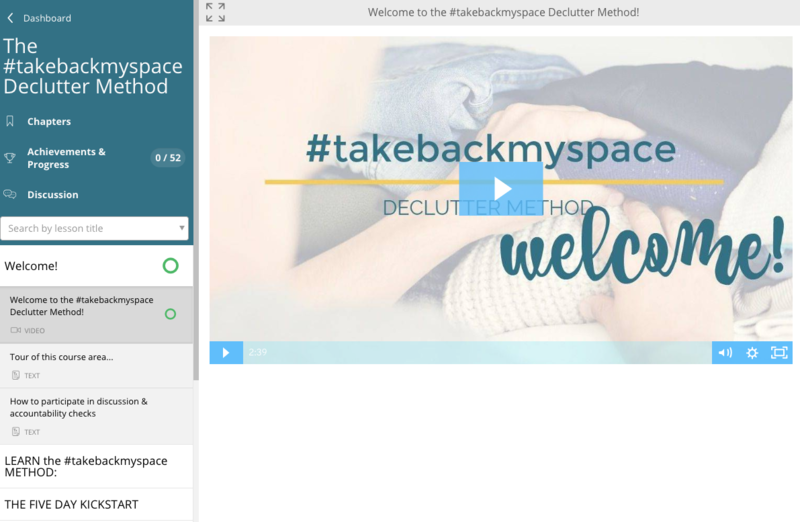 Start with the welcome video and the foundation videos to learn The Declutter Method. You can complete The Declutter Method on your own schedule and will have lifetime access to the course material. 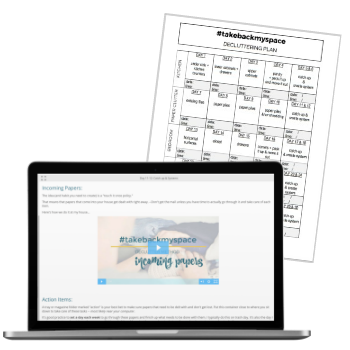 The entire program is completely digital so you can access each decluttering task from the comfort of your home and print out your printable decluttering plan trackers to keep you on track. As soon as you enroll you’ll get instant access to all of the learning material. It’s laid out in order and you can work through it at your own pace. 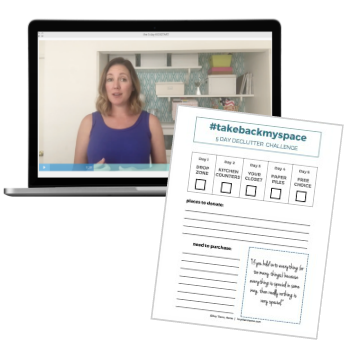 You’ll start with the video lessons to learn how to create your criteria for what to keep and what to let go of, then move into learning the Declutter Method. You’ll put what you’ve learned to use right away during the 5 day kickstart designed to take decluttering a little bit at a time and get you practicing the method. Once you’ve completed the kickstart you’ll move onto decluttering tasks that focus on five areas in your home and lay out an exact plan for you to declutter these areas using the method you’ve learned, still one small decluttering session at a time. You’ll have lifetime access to the course material so you can go back to the information and printables whenever you want to revisit a specific area or to brush up and get motivated again! What is the time commitment each week? 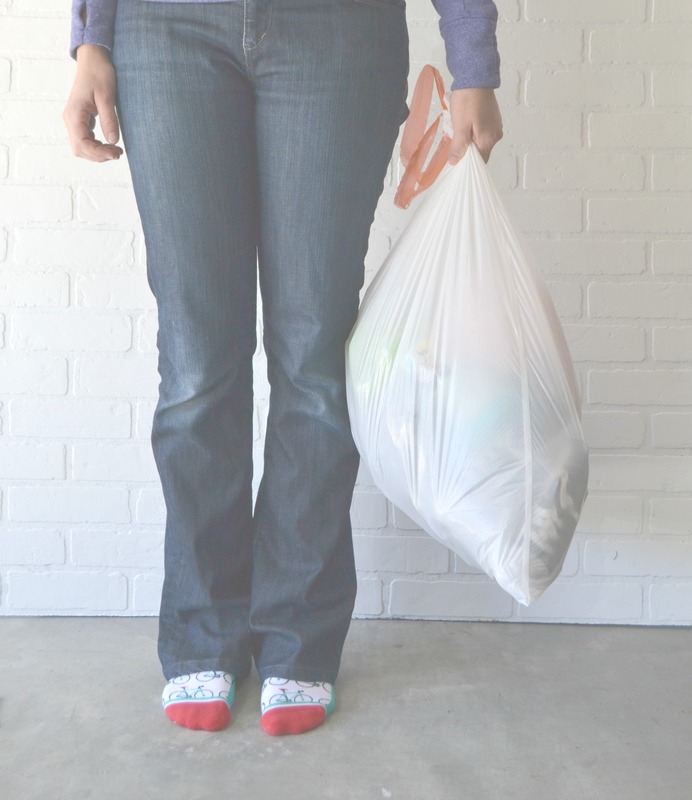 The course is divided into 30 specific decluttering tasks. Each task should take about an hour to complete. The number of tasks you go through in a week is up to you, but I’d recommend setting aside at least 2-3 hours per week to dedicate to decluttering so you see real progress each week. Will I have to go out and buy a bunch of new organizing systems? No. Absolutely not. The focus is on getting rid of what you don’t need or like. We will also be setting up systems but we aren’t out to impress Martha Stewart here people. We’re setting up systems in a super simple way with real life in mind. There’s a 30 day money back guarantee. If you do the work and are not satisfied just shoot me an email and I’ll issue you a full refund. You can pay with a credit or debit card or with PayPal through a secure payment system. DON'T BE STUCK IN THE SAME PLACE YOU ARE TODAY 6 MONTHS FROM NOW!